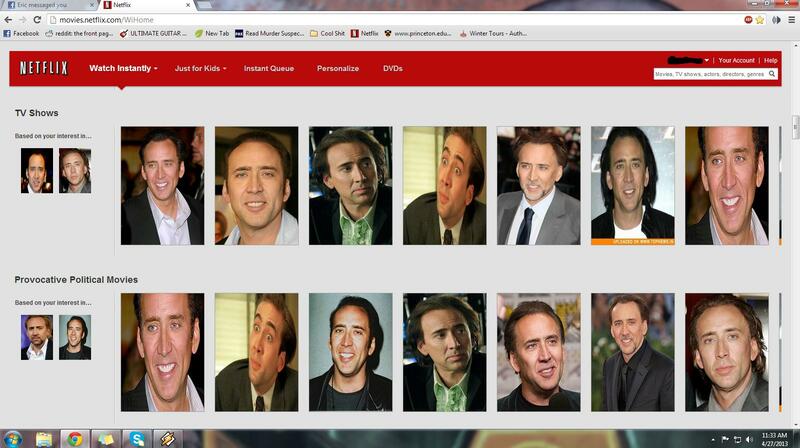 Nic Cage, In Your Face, (No) Thanks to nCage Browser Extension | OhGizmo! Nicolas Cage is a great actor, although he hasn’t been in many good movies lately. Regardless whether you agree or disagree with that, I’m fairly certain you wouldn’t want to see his mug plastered all over your computer screen. Unless you’re his ultimate mega fan, that is. A browser extension that does exactly just that is called nCage. It’s perfect for pranksters and for the aforementioned mega fans, because it basically turns every image on your browser window into a photo featuring none other than Nicolas Cage. They’ve mixed it up, too, so you’ll be treated to a slew of Nic Cages with various expressions, hair styles, and eye sizes (yes, there’s one where he does the crazy eyes.) Check out nCage here.